Islam is the main religion in Prishtina and Kosovo. This is the reason why the Central Mosque has to be a building-landmark in the city of Prishtina and should dominate and get involved in its urban context. 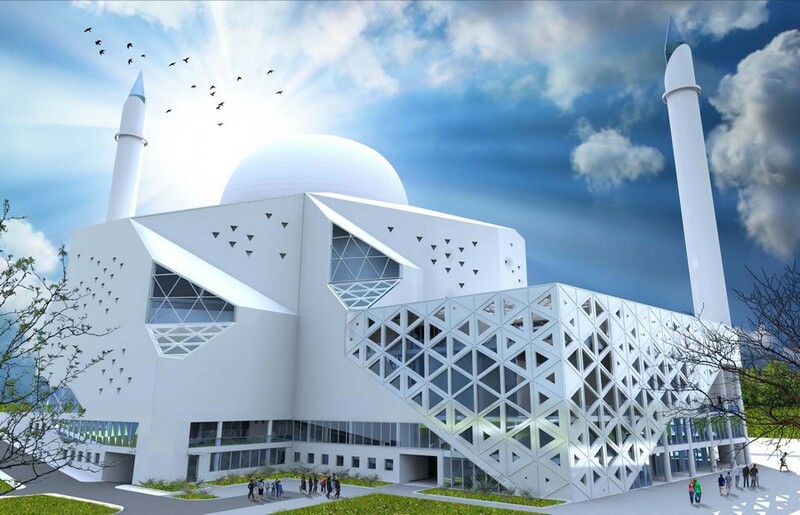 In our design, The Mosque has important and central role in the city. During the analisys of the surrounding built environment, we realized there are two dominants: the Building news agency Rilindja and the boiler chimney of Dardanija (which was an inspiraton for minaret design in our work). The building is representative on a level worthy of a Central Mosque, not only by its monumental mass, but also by its contemporary architectural quality, symbolic expression of Islamic identity and tradition. Architectural expression of the mosque reflects prayers physical and spiritual position and that is towards Qiblah. That affects all mosque elements we opened (directed) towards Qiblah and its light. This is especially related to the effect of the quarter dome, mihrab and minaret, the overall impression of Qiblah and the light from that same direction. The design of the Mosque and its disposition are required to location, its specific function, urban technical parameters and orientation of the complex towards Mecca. The main goal is to achieve an architectural quality of all areas: from the moment you step into the courtyard (an outdoor area) to the moment of entry to the prayer hall. Strong relation to local and Islam architecture is achieved through an open public space – the plaza. That same square is in one moment an open, outdoor area, and in another, it becomes intimate and has the character of atrial prayer space with the fountain in the middle. A. Creating an unique, open space – plaza, within area of 50%. This area is going to be used as open, for the Mosque users during the two Islamic festival prayers. There is possibility for using an electronic Mihrab for these occasions. In that way, the whole groundfloor area is organized with the prayer lines. B. There is achieved the greatest distance in relation to the Post and Telekom office building. Its autonomy is kept, while the Mosque dominates the space and atmosphere of this area. C. Pedestrian ways are designed for easy orientation in space, from the dominant directions-from the future plaza and library on the west side of the location (above the St Ilaz Kodra), from the pedestrian paths of the St Nene Tereza and its underground passage. Underground garage levels are connected with the plaza through elevators and stairs, set in a diagonal way. Their position is next to the two minarets in which we installed elevators. The groundfloor level, as the most representative part of the Mosque, is available for the access of praying people in any way, during the great festivals or everyday prayers. It has requested contents – praying hall and its ancillary facilities, and Little mosque for everyday prayers for 300-350 people. Little mosque is created with screens below the mahvils to save the energy. Its height of 8.00m is racional in all aspects of using this structure. Mihrab, mahvil and kurs are mobile and can be removed from time to time, when that’s needed. Screens can be made of the material with the acustical features and some decoration. The space in the mosque, for men, is created in accordance with religious rules and requested capacities. There is direct connection between this space and the Imam’s office and his apartment (levels -1 and -2). The space for women, is divided into two mahvils. The horizontal character of the prayer hall is reduced, and the attention is focused on its height. In that way, the dome and its light are fully exposed. On the first level of mahvil, there is a garden for women – like the Qur’ans images of garden and all the facilities in them. On the level -1, there are all facilities that program provides, with the high usage of natural light (ablution areas, classrooms, offices, Imam’s office, child’s day care room). Restaurant and other commercial spaces have the access from the pedestrian way that goes from the St Ilaz Kodra, through the passage of the St Nene Tereza. On the levels -1 and -2 we suggested extension of commercial and other facilities, because that is the space needed in garage areas, in order to accomplish capacities requested (levels -3 to -6). On the level -1, on the north side, near the St Nene Tereza, an aditional area is predicted. This area contains the toilets and ablution areas, available during Islamic festivals for praying people on the square. On the level -2, we organized commercial facilities and a conference hall. This level has the access from the future plaza on the west and a parking lot from the northern side. So, there are three possible ways of access. On this level, Imam’s apartment can be approached from the parking lot on the north, or from the inside of the building. Imam’s apartment has all the facilities needed, especially the garden and the direct connection to the office (on the level -1) and the Mosque groundfloor area. On the levels -3 to -6, there is a garage with some technical facilities, toilets and vertical and horizontal communications (stairs and elevators). Considering that requested capacity of garage area took the whole space of the location, we suggested the same expansion of levels -1 and -2. As we said, on that aditional area, we organized an extra commercial space. The starting point of the philosophy of design – face towards Qiblah – is attached to Mecca and its light. That’s the main reason why we have chosen quarter glass dome. It is a recipient of light, just like the transparent frame of mihrab. Light is the attribute of Allah. Two minarets are incorporated into the urban context. Their top is made of glass, and receives the light from the direction of Mecca. The design of Minarets has traditional character and is different considering the shape of the boiling chimney of Dardanija. Wall perforations on the facade has that same role. The Light spreads during evening Islamic festivals, giving feedback effect and gratitude to Allah, with great symbolic meaning. The dome and its design has the character of tradition but with one new feature. The quarter dome has an original design; it serves for orientation to it and seems different from every part of the city. The roof construction, that is directed towards Mecca, has its part in overall expression and desired composition. In this way, we wanted the Mosque to have that human dimension, the spirit of the prayer person. Considering the questions about the city, its silhouette and the footprint of the mosque, we concluded that optimal height of minarets is 80m from the level 0.00 and the height of the dome is 80m. Arabesque ornaments on the mosque envelope and its facade has its origin in first ornaments in Islam – the triangle element made of bricks. The University library in Prishtina and its frame, as the symbol and one of the most known city attributes, encouraged us to show the connection between science and religion in Islam, in this way. Phd Rifat Alihodzic – Project leader (Professor on the Faculty of Architecture in Podgorica, University of Montenegro) MSc Ema Alihodzic MSc Elvira Muzurovic Mirza Mulic, architect Ivana Rajkovic, architect Gordana Rovcanin, architect Marija Kneževic, architect. Mosque of Prishtina Competition: http://cmprcompetition.com/?p=171.